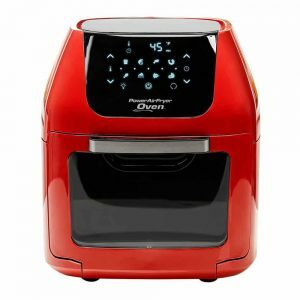 Power Air fryer oven is probably one of the best multitasking air fryers that you can get for your kitchen. While reviewing this air fryer, we instantly fell in love with it and it has worked amazingly well for cooking almost all the snacks that we usually deep fry. 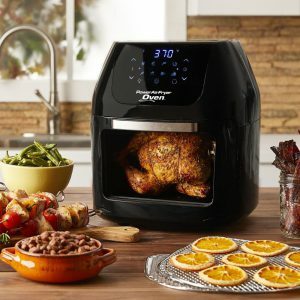 If you have to lose a couple of inches from your waist and are looking for an air fryer that would help you do so then the Power Air Fryer Oven is probably one of the best ways to go for. This air fryer can cook almost anything to perfection and that is one of the reasons we love them. There are two models of the Power Air fryer Oven and we would discuss both of them in great detail but overall both the airfryers have been wonderful and if I had to choose then I would not regret buying these Air fryers in comparison to other air fryers available in the market. 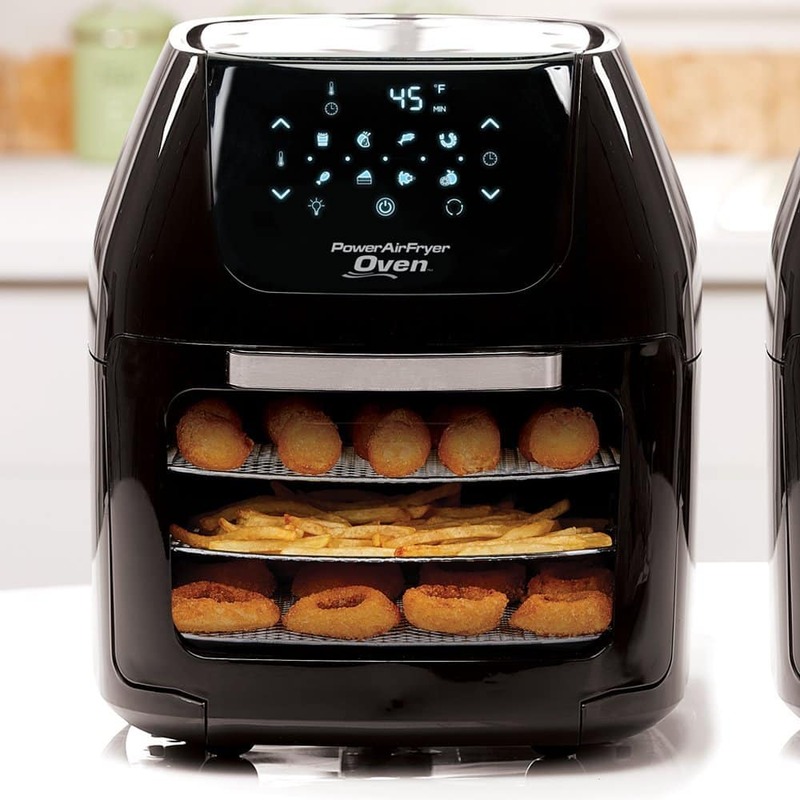 The Power Air fryer is slightly larger in capacity than the usual 3.4 qt air fryers and instead of having a basket you have trays, which is similar to the oven. However, this appliance is much lighter than the oven and is portable. 1. Capacity- If you are looking for an air fryer then you should definitely consider the capacity of the fryer. If you live alone and plan on cooking just for one person then the small 3.4 qt air fryer would do the trick, however, the ones that we mention in the post are quite larger than that. These Power air fryers mentioned above have a large capacity and you can easily cook food for 3-4 people at a time. Although this air fryer is not big enough to cook for a party it does a pretty good job of cooking for a family. 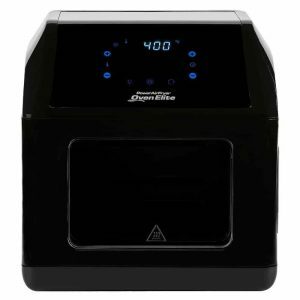 This is probably one among the large airfryers that are available apart from the NuWave Airfryers that we have seen before. Although I prefer the Power Air fryer oven over any other air fryer as it has a better quality and is durable. 2. Cooking Basket- Now, this air fryer has a slightly different way to fry food. 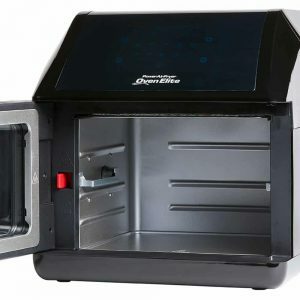 Instead of the regular air basket that we usually see in air fryers, these Power Air fryer ovens have racks where you are going to place your food so that they get cooked properly. If you are not a fan of this then you might want to consider some of the traditional air fryers from Philips. However, if you just want your food to get air fried regardless of the design and style of cooking then you might end up loving this air fryer. 3. Functions– There are different functions and pre-settings on different air fryers and what functions you need highly depends on the dishes you aim to cook inside the air fryer. If you plan on going all chef mode and want to try out as many dishes as possible then you should definitely work with air fryers that have multiple pre-settings stored in them. The Power Air fryer ovens mentioned have multiple settings which you might find useful to cook various dishes. Although other air fryers that are cheaper than this one has pre-settings, they either do not have enough space or do not do a good job cooking all the dishes. So, you might want to see what you need and compare it to the air fryers recommended and see which one is suitable for your needs. Air fryers are a really good investment an if you are looking for something that would help you cook food with little or no oil then spending $100 for an appliance is a really good investment. A simple Air fryer with basic features would cost you around that and if you are looking to cook most of your dishes inside an air fryer efficiently then you might look at the ones with larger cooking space and more features. The air fryers are amazing and if you are looking for something that has a good price/feature balance then I’m pretty sure I would definitely recommend you the Power Air fryer ovens. The Power Air fryer Oven plus is of 6 qt capacity which is not that big but it is pretty huge in comparison to the regular air fryers that are 3.4 qt to around 5 qt large. This air fryer can easily cook for 3-4 people which is pretty good for someone who plans to cook food for their family in an air fryer. If you are looking for cook long term in an air fryer and want to include air fryer cooked recipes in your daily diet then you should definitely consider investing in this appliance as you would not be disappointed. • The Air fryer can cook almost anything and everything. I like that it has racks where you place your food items which are to be cooked. Being one of the best air fryers, this one from Power Air fryer Ovens has got the design right making it easier to cook food. • The Air fryer has a really large capacity which means you can easily cook for 3-4 people. You can even cook a 3-4 pound chicken in the rotisserie which is pretty amazing for an air fryer. • The Air fryer is pretty fast in cooking and you can cook chicken wings in about 10-15 minutes. The Air fryer has pre-settings for most of the dishes and comes with a cookbook which you can use to determine the time and temperature that you need to get the food cooked perfectly. • The air fryer has a different design in comparison to the other air fryers that results in even cooking of the food and you do not need to pull out the cooking basket again and again in order to turn around the food for even cooking like in the case of regular air fryers. • The taste of the food cooked in the air fryer was pretty good and the chicken wings that we cooked were perfectly crisp on the outside and juicy on the inside. It takes as little as 1 tsp or no oil to cook in this air fryer and the taste is pretty damn good. • The air fryer is easy to clean, all you have to do is remove the racks and the bottom tray where all the oil has been spilled and you are good to go. This air fryer is probably the easiest to clean and it takes about 5 minutes to clean it all up. • The air fryer does have a sound to it and you might not be bothered with it, but you can certainly hear it while working. Nothing irritating and I was definitely okay with it. • If you want to use the Airfrryer to cook a chicken then you might be able to cook maximum 4-pound chicken which is really small. So if you want to cook chicken for the family then you might want to think about it twice. While cooking chicken wings we did find the first row of wings had a much better color than the ones on the other two bottom racks. Although all the chicken wings were cooked perfectly, the color was much better on the wins that were closer to the heater. Personally, I found that the air fryer did an amazing job as all I had to do was put the chicken wings in the oven and wait for it to cook to perfection. Cooking french fries is the biggest challenge in most of the air fryers as you constantly need to remove them out and turn around the fries and then put the basket inside again for cooking. In the air fryer, we put it inside a cylindrical basket and then on the rotisserie, this made it easier for the french fries to cook evenly as they kept on turning on the rotisserie. A perfect solution to the usual air fryer problems. Now all I do is put in the French Fries and go ahead and watch some TV only to come back when it is all cooked nicely. The taste of the French fries is pretty good, not exactly like deep fried but it is very close to that. Well, I did not try making pizza from scratch but I definitely reheated a cold pizza and it did the job pretty well. Overall I’m actually impressed with this air fryer as it cooks almost anything really well. One of the best ways to cook your cold pizza is with this air fryer. It can cook anything to perfection and the pizza that I cooked was crisp at the bottom with the cheese melted on the top and perfectly cooked toppings. This is my personal favorite when it comes to reheating small pizzas and it does an amazing job. Apart from the ones mentioned above, I did try cooking fish and it was perfect! Like there was no way you could tell it was cooked in an air fryer. Cooking a chicken was a bit difficult as it got messy but in the end, the results were pretty impressive and I felt that this is much better than an oven. You can cook almost any snacks that you would deep fry and the best part about this fryer is that you do not need to pull out the basket mid way while cooking just to turn around the food for even cooking. You can put it in the fryer relax and come back when it’s all nicely cooked and done. 1. The Airfryer can literally cook anything without making it dry. 2. Has enough pre-settings to help you cook any dish. 3. It has a rotisserie which works amazingly well and cooks everything so evenly that you would not have to remove food to turn it around for even cooking. 4. The air fryer is spacious which means you can easily cook food for more than 2 people. 5. It has racks inside which ensure even cooking of all the food that is being cooked. 6. The taste of the food is amazing. 1. You may not be able to cook for more than 4 people at a time inside this air fryer. This is another Air fryer from the Power Air fryer oven and in this fryer, you have a few more additional features which makes it a multi-functional air fryer. There are not too many difference between the two fryers. However, there are just a few extra add ons on this air fryer that you might want to take a look at before buying one of them. • The air fryer has a better heat retention and can cook your food way faster in comparison to the previous fryer. This is pretty good for someone who is super busy and loves to cook food really fast as they have no time to spare. • The Airfryer has some additional pre-settings making it really easier to cook different dishes. Usually, I like it when an air fryer gives me more options to choose and cook the dishes that I wish to and comes with a preset timer and temperatures for those dishes. • This air fryer comes with a cookbook so you can always look into it if you want to cook various dishes without burning them or making them completely dry. • The air fryer has a different design in comparison to the other air fryers(but similar to the one mentioned above) that results in even cooking of the food and you do not need to pull out the cooking basket again and again in order to turn around the food for even cooking like in the case of regular air fryers. • The air fryer does have a sound to it and you might not be bothered with it, but you can certainly hear it while working. Nothing irritating, I was definitely okay with it. • The door opens sideways on this air fryer which is a massive improvement as on the previous fryer, it felt like I would burn my hand while pulling out food because of the hot insides of the door. One had to use oven mitts in the previous fryer but due to better design, this is not the case with this air fryer. • The Air fryer has a 6 qt capacity and I expected it to be a bit larger as that way I could cook more amount of food at a time which would work well when we have guests at home. The chicken wings that we cooked were slightly better than the previous air fryer and they did take lesser time than the previous fryer. The wings were all crisp on the outside and the insides were juicy just like you would expect them to be when fried. We used minimal oil which was like 1 Tbsp while marinating the chicken wings and that is all. The wings are my favorite and the fact that I was able to cook them for 10 minutes to perfection was a joy. Make sure you spray some oil on the grill before placing the wings so that the wings do not stick to them. French fries are not something I’m usually fond of but this fryer did cook it in a much healthier way and I definitely liked the fact that they were crisp on the outsides and soft on the inside. However, in the case of both the air fryers, I felt like the french fries looked dry but were moist and juicy on the inside. They taste okay but one would definitely feel the difference between the deep fried fries and the ones cooked on this air fryer. Cooking chicken breasts was definitely better and you can just leave the marinated piece of chicken on the grill and set the temperature and timer. You would get a perfectly cooked chicekn once it is done and I was not at all disappointed with the results. This air fryer does a good job at cooking fish as well and I did not see way too much difference in performance, but yes the improvement in design is a great help. This air fryer is much easier to use and hence I would prefer this over the previous air fryer just for a few bucks more. 2. Has more pre-settings than the previous fryer to help you cook any dish. 6. The air fryer is definitely an upgrade from the previous air fryer as you can cook food much faster inside it and it has the door opening sideways which comes really handy while removing cooked food from the air fryer. Both the airfryers from Power Air fryer Ovens are pretty good and the Elite air fryer is an upgrade from the previous one. However, for the price, both the air fryers have to offer features that are impressive. The Power Air Fryer Ovens are spacious and have a great design that would help you cook all your meals to perfection and with little to no oil. If you want to lose weight this year and if it is the fried foods that are bringing you down or the junk food then you should definitely invest in this air fryer. Eating in moderation and cooking fried foods like French fries and chicken wings in a much healthier way is definitely going to help you reduce weight. This air fryer is going to help you make healthier food choices and with the intelligent design, you do not even need to remove the basket again and again in order to check if the food is cooked evenly. The design was something that I liked the most in the air fryer along with the fast cooking times and ample space. You can easily cook food for 3-4 people and if you have a small family then this air fryer can help you cook quick meals for your family. For someone who works full time like me, I loved these air fryers and I would definitely recommend them to anyone who wants the best and most efficient air fryer. If the price is not an issue then you should get this air fryer. Check out the product on Amazon and let us know what you think in the comments below! If you have any experiences with both the air fryers then share it with us in the comment section as it helps our readers immensely! Do you know someone who can’t live without Frech fries and still wants to go on a diet and lose weight? Share this post on their wall!